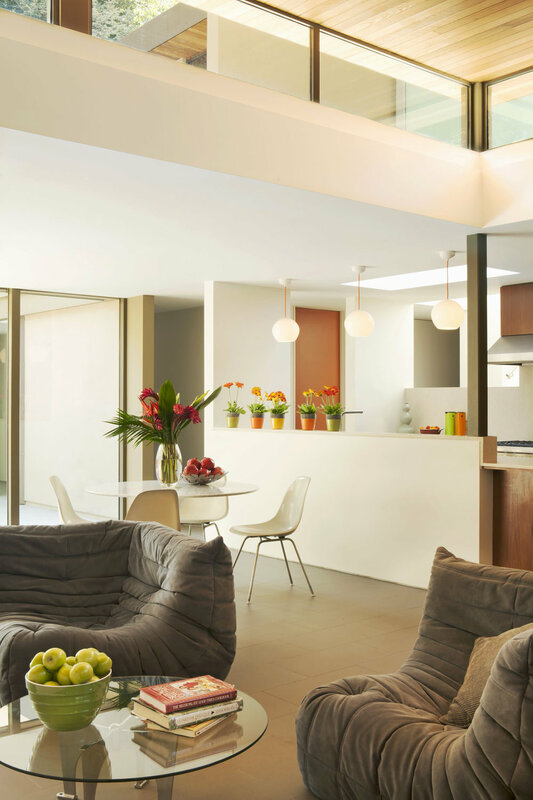 This project is a sympathetic renovation of, and addition to, a mid-century modern, courtyard-style residence in a verdant canyon close to the ocean in Los Angeles. It suffered years of neglect but the light and space of the original house along with the location, open layout, and modest size (and the incredible pine trees out front) were extremely compelling to the clients. BiLDEN gutted the entire house, retaining the perimeter concrete block walls and the basic footprint. The existing entry courtyard was partially enclosed to create an expanded family room/kitchen while the entry is sheltered beneath the new cantilevered roof that provides a dramatic view of the pines and sky through the oculus. 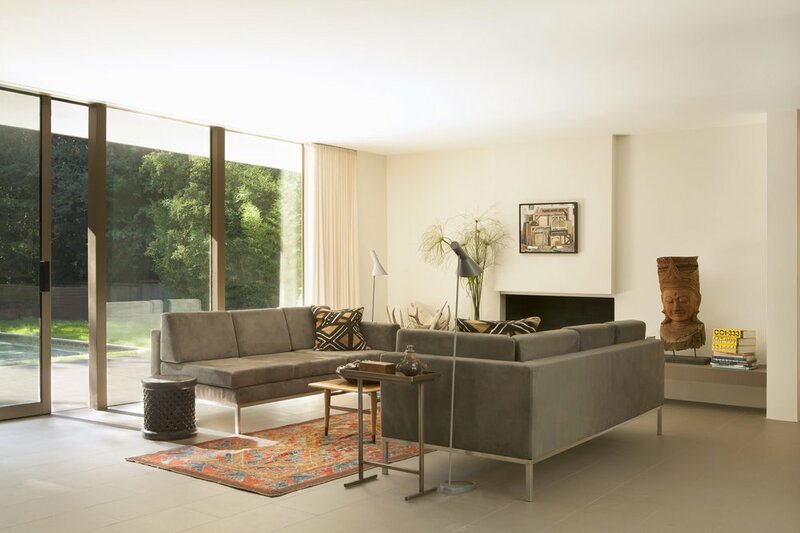 Porcelain tile flooring was carried throughout the ground floor for visual continuity and, by paving the terraces and central courtyard with the same material, the connection between the interior and exterior was reinforced: a fundamental tenet of mid-century modern houses. The interstitial walls of glass were rebuilt and re-glazed with dual-pane, energy-efficient doors and windows. 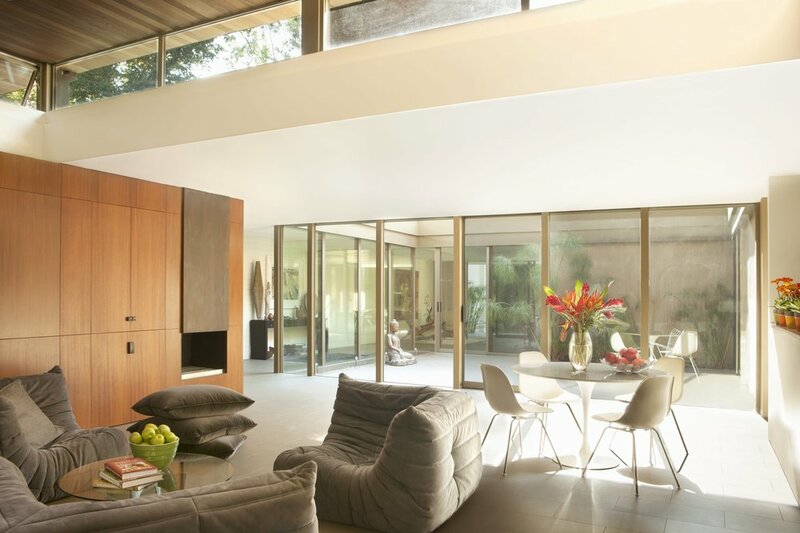 Materials were selected for low-maintenance and resonance with the house's mid-century roots as well as compatibility with the wooded, canyon context. With the addition of the new partial second-story master suite, BiLDEN paid particular attention to the integration and composition with the existing house so that it respects and extends the existing architectural language and form in a creative and compositional way. The predominance of wood in the master bedroom creates a cabin-like atmosphere appropriate for the canyon context while, at the front, a partially frosted glass ‘lantern’ containing the stair adds light and view while retaining privacy.